Historic images of the Holton Town Square and other towns in Jackson County are set to be on permanent display at the Jackson County Courthouse soon. 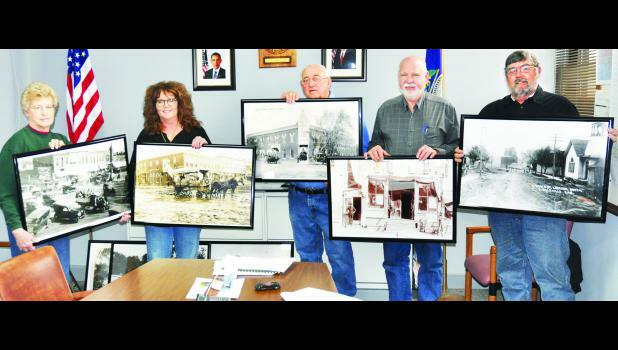 Verlin and Sue Wichman of Holton presented to the county commissioners recently enlarged reproductions of several penny postcards from the early 1900s that featured the Courthouse, the Holton swimming pool and downtown Holton and Circleville. After viewing the 19 images selected by the Wichmans, who enjoy researching local history, the commissioners agreed to purchase all of the large images for $45 apiece. Many of the reproduced photos were already framed. Jackson County Clerk Kathy Mick, who is a member of the Jackson County Historical Society, said she sought Verlin Wichman’s help to fill up the many bare walls inside the Courthouse. On the back of each image is a date and a short description of the image, and the commissioners considered including that information on a plaque or frame next to each piece. “Doing all the research is fun and addicting,” Verlin said. The commissioners said they are also interested in Wichman finding and printing older photos of the other towns in the county.